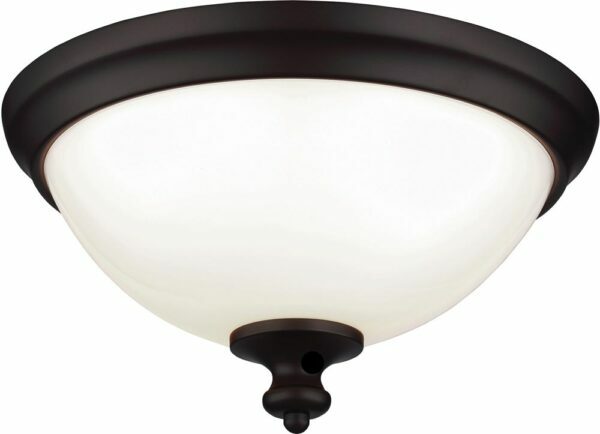 The Parkman 2-lamp opal glass shade flush light finished in oil rubbed bronze. A classic design reminiscent of bygone days, featuring a full sized ceiling mount and 33cm opal glass dome shade with an oil rubbed bronze finial. The Parkman collection is a period-inspired group of pendants and flush mounts featuring classic detailing taken to a modern scale. The largest option is an over-sized silhouette sure to make a dramatic statement. Group several pendants together of consistent or varying sizes to create an impactful installation where a chandelier might traditionally be placed. With influences of schoolhouse and library designs, the elegant Parkman range is a classic designer feature suited to many styles of installation. Perfect for use with very bright energy efficient fluorescent spiral lamps and idea for any room with limited ceiling height. The Feiss Parkman oil rubbed bronze 2 lamp opal glass shade flush light is designed in the USA by Feiss, founded in New York in 1955. They have become well known over the years for their contemporary yet classic styling, quality and great original designs. Feiss continue to maintain the highest standards in materials and workmanship to this day.